Workers from the Taff Vale Railway who died in the First World War are now honoured at one of Wales’ busiest stations, and historians are seeking further information from descendants. 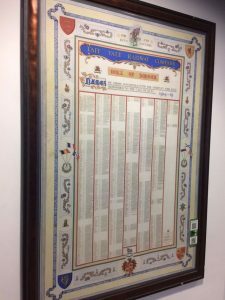 The hand-written Roll of Honour on a wall at Cardiff Queen Street station lists all of the TVR company’s employees who served in the Great War. Those who died are denoted with a mark beside their names. Now Arriva Trains Wales, Network Rail and information project HistoryPoints have placed QR codes near the Roll of Honour so that anyone can receive more information on their mobiles – including details of when the men died, where they are buried or commemorated and often their home addresses and next of kin. HistoryPoints researchers would like to hear from relatives who have further details of any of the TVR men who died. Richard Martin, Station Manager at Cardiff Queen Street, said: “We’re honoured to be able to remember those railway workers who gave their lives fighting for their country. Among those who died was Gunner E Palfrey who was killed on 21st October 1916 aged just 26. Having grown up in Penarth as the son of Walter and Norah, Mr Palfry was living at 8 Cwmdare Street in Cathays with his wife Bessie when he answered his country’s call. Another was Private Mervyn Reginald Cole, 23, who grew up in Llantwit-Vardre, Pontypridd. Having servied with the South Wales Borders, he died on 2nd August 1917 and is buried in Bard Cottage Cemetery in Belgium. Three years ago HistoryPoints created QR codes which are displayed beneath the Great Western Railway war memorial on the concourse at Cardiff Central station. Since then the information about local GWR men who died in the First World War has been viewed by many hundreds of people, either by scanning the QR codes with mobiles or on home computers. To see the TVR Roll of Honour, turn right immediately after entering the station through the ticket gates, as if going to Platform 5. The document and QR codes are on the wall to the right. To scan the QR codes, search online for a free “QR scanner”, if your phone doesn’t already have one. When you’ve installed the scanner, activate it and hold the phone’s camera up to the QR code. The information is free to view (other than any data charges by your mobile provider). Anyone who has further information about local railway men who died in the First World War can get in touch with the researchers by using the Feedback form on the historypoints.org website.